This is required by Volvo between 40-60 hours. It can be done by an authorised Vovlo agent or failing that any qualified diesel engineer. It should be well documented. All that is required is to change the engine and transmission oil and check all is working. Our fan belts seemed to be wearing with some dust noted coming off. We were told this is normal "settling in" for a new belt. We had ours done in Vigo at Marina Davila Sport by Krug Naval. We emailed both in advance and the marina helped us coordinate a time, which was a little loose, however we got it done which was a relief. Download the Volvo Penta dealer locator app to find an agent near where you think you will be when you need a service done. In order to get some air under the mattress and hopefully avoid mould, Keith installed these Ikea bed slats under the master bed. They did need to be cut down to size to allow for the taper. Time will tell whether this exercise is worthwhile. You can buy a kind of slat matting from the chandlery in La Rochelle to use as well. Others have done this and claim it works ok too. 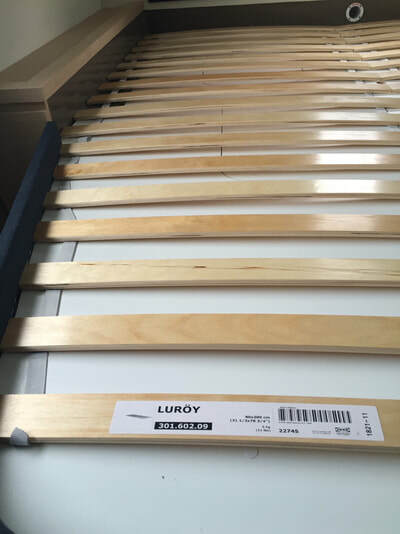 FP charge EU290 per bed for these, Ikea EU60 (plus gaffer tape which you have anyway). OK so water gets under the door and runs out onto the floor in front of the sink. There is no seal at the bottom of the door. Really FP! 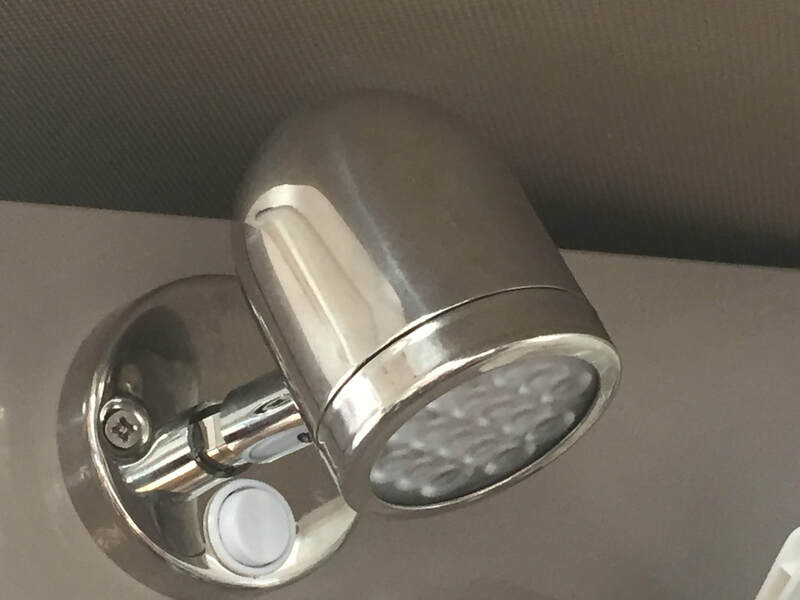 I checked the FP Owners FB page and sure enough this had been discussed and a solution recommended. I ordered one of these online from a shop in Australia (who knew you could have a business solely selling door seals!) and had it delivered to an unsuspecting guest, about to arrive. YES! Now installed and it works a treat! 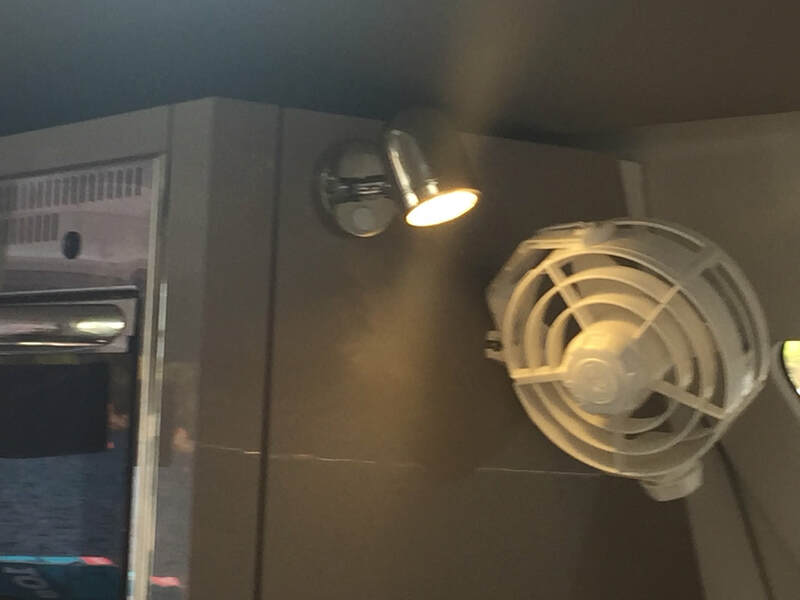 I was finding the lighting over the cooktop a bit dim so Keith fitted this LED swivel light on the same circuit as the fan and oven lighter. We had one on our Lipari and it makes quite a difference cooking, particularly underway in the evening, as you don't have to have too many cabin lights on. Attaching a handle to the back of the helm station is helpful because it is used as a walkway by guests and crew. Otherwise people tend to grab hold of the top of the pedestal as they walk past, accidentally touch the Garmin screen and inadvertently put in a new waypoint! Who knows where you might end up! 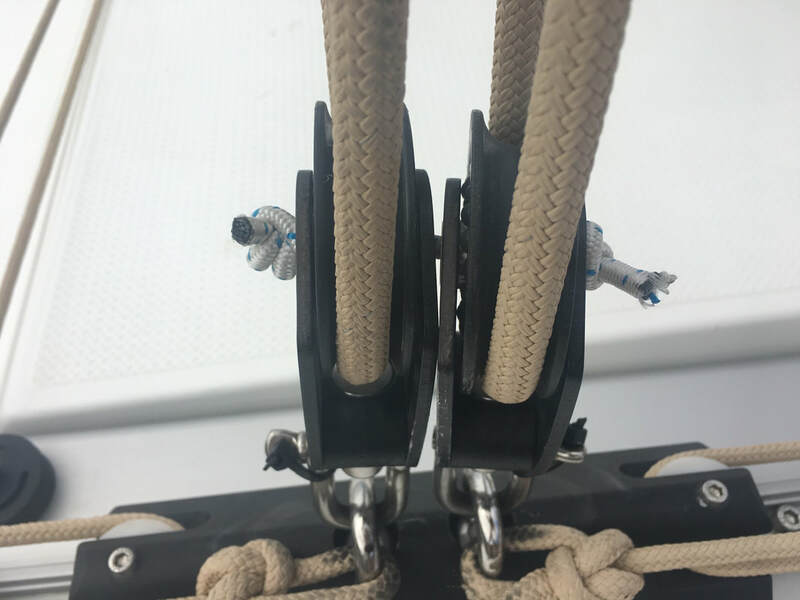 Its great to have friends come and stay on ITIKI, even better when one of them happens to be an expert rigger. Thanks Mr Peter Messenger for these little tips. Thanks also Pete for also doing a little rig check for us. #1 Cable ties on shackles and shackle pins to stop them coming undone at an inappropriate moment, like the middle of the night when Lynda is on watch and its blowing dogs off chains! #2 Shock cord through the traveller sheet blocks to stop them catching when slack. The first reef on the Helia is a continuous line which is great because no-one needs to go to the mast to attach the luff downhaul. Whilst we were on the FP dock at La Rochelle an experienced delivery skipper beside us mentioned that the first reef is subject to chafe and predicted that we would lose it after the first use! Well he was right about the chafe but fortunately we didn't lose it. Keith moved it along but next time we used it, same again! Mr Messenger had a look we realigned the way this line was feeding through the cringle, so it was not coming back over itself. We will need to wait and see how this goes next time we use it. Haven't had enough wind in the Med to test it yet. The 2nd and 3rd reefs (reeves??) are on separate lines. 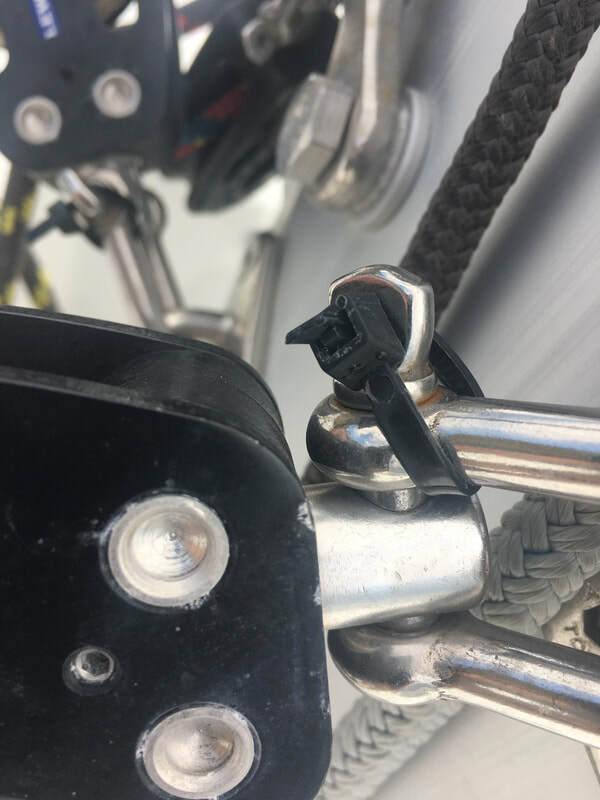 We had Uchimata install this extra cleat on the coachhouse for a reef downhaul. We can use this for 2nd or 3rd reef, and can set it up depending what weather we are heading out into. It works a treat, as again no-one needs to go up to the mast in a blow, when it is quite dangerous. 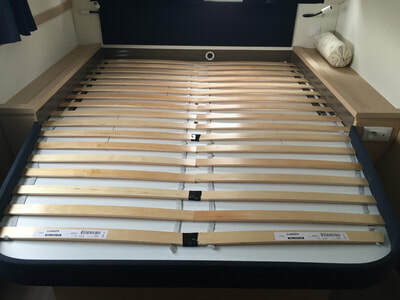 Due to the placement of the gaff batten, which is permanently attached to the mast at the 2nd top car, it can be difficult to attach the head of the sail to the top batten car before hoisting. You need to be able to pull the head close enough to the top batten car to shackle it on, and that means going to the mast and trying to reach it and pull by hand. Leaving it attached is not practical as too much of the sail would stick out of the lazy bag when the sail is down. As a result each time you hoist the main “someone” (usually Keith) has to go up to the mast as the main is being hoisted and perform the tricky manoeuvre of bringing the ring on the head of the sail close enough to the car to attach it. Even at the towering height of 5’ 10” this is close to impossible and can be dangerous in rough conditions. Click here to see our neat solution! This is what we used for ITIKI when left in the water for 4-5 months. As you can see some if these things will need to be “undone” when we come back, so we will develop a “restart” checklist! Click here to view. Our first winter we stayed in Hammamet, Tunisia. Our package wintering time (from 1st October 2018 to 30th April 2019 was: mooring fees TND6,143 (~ 2080 euros), water and electricity are not included and on counters. I will add a review to Noonsite.com at the end of our stay.